Nonetheless, it comes in a sturdy metal case, the level knob, the button… everything really looks & feels top notch. (Not nice detail: I know this thing is idiot-proof, but the manual is only available as PDF on the website, not included). The foot-switch itself works very well, even though it’s really tiny. I would recommend placing it in a horizontal (not original vertical) position. This way, you can see the LED when your foot is on the switch. I kind of get the minimal footprint vision and it makes sense on most pedalboards. Personally, however, I’d also like to throw in the small pedal into my backpack when I feel like (you never know when the next opportunity for live looping arises…). Also, some guitarists who rarely use the looper might appreciate a battery option. Let’s hope there will be a battery option here in the future that is only slightly bigger (i.e. like the PolyTune vs PolyTune mini). Let’s talk about the sound (- and this has actually been the main reason for me to get another one-button looper alongside the Boss RC-2). I want a looper for my pedalboard that I can leave on the FX chain and that won’t deliver a blurry digital sound or any noise. This may sound as something simple, but actually is a big thing. If you want a looper in your FX chain for performance, clean sound is absolutely essential. – And here is the best feature: In Play/Overdub mode, whenever the loop passes the starting point, it briefly blinks just once. When I remember how often I had a two-bar loop where I couldn’t tell the loop starting point on my RC-50… This should be a default feature for all hardware loopers!!! This whole LED display functionality gives you the feeling that people at TC Electronics have put attention into details. In Stop-Mode, long-press will delete the loop. However, until the long press kicks in, the initial press will re-trigger the loop – until it finally stops and gets deleted. Interestingly, the Boss RC-2 has the same “feature” (that’s where the optional 2nd pedal was useful). 1.) Double-press with long-press: Stop the loop & delete at same time. 2.) In stop-mode, turn down loop level to 0, then long-press for delete. 3.) In stop-mode, double-press (as quick as possible) with long press. (this is what the PDF manual actually recommends). This is a serious issue that requires a work-around imo. Finally, one more positive detail: When you plug-off the looper while there is a loop on it, it will store it. Next time you plug-in the looper, the last loop is there, available in stop-mode. So, to sum it up – I am very happy with the Ditto Looper and will definitely keep it. Lack of battery really limits the flexibility. Let’s hope – just like the PolyTune vs PolyTune Mini – they come with a slightly larger battery version. (I would certainly get it). – In Stop-Mode, LongPress should delete the loop without re-playing the loop (until longpress kicks in). For this, you’d have to compromise the re-trigger a bit (re-start loop in stop-mode only when foot goes up). But it would be worth it in terms of functionality. – While we’re at it: Why not finally add a Mulitply function? (Activate it with LongPress in Overdub-Mode; blinking red light in multiply mode). That would be so sweet!! If you are looking for a fun, mobile looper for jamming, I’d probably stick with something like the Boss RC-2/RC-3 that gives you a battery option (“rhythm”/tempo accomp. might be also useful for jamming). 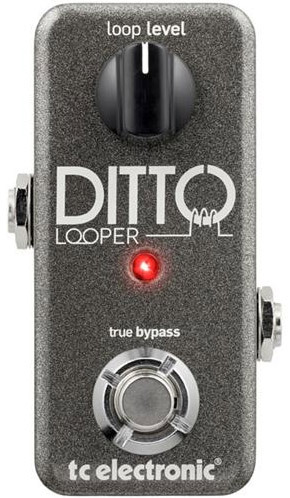 However, if you want a high-quality yet simple, affordable,& minimalistic looper for your live performance rig (that doesn’t compromise sound quality in your FX chain), the Ditto Looper might be the best choice so far.